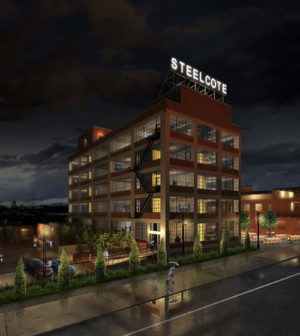 Pinnacle Contracting, Inc. has been tapped by St. Louis-based developer Pier Property Group to execute the historic renovation of the Steelcote Manufacturing Company Paint Factory complex at 801 Edwin Street in mid-town St. Louis, Mo. Pinnacle is targeting a spring 2019 completion for the 42,000-square-foot, $9 million conversion that will create 31 units in the landmark five-story building. A second adjoining structure will house the leasing office and bike storage while a third building will host two additional units bringing total residence count to 33. Fifteen indoor tempered parking spaces and exterior gated parking for guests and residents will also be constructed. In addition to traditional loft floor plans with 10- to 12-foot ceiling heights, two-story units with rooftop terraces and panoramic views of St. Louis will also be available. Loft finishes include oversized window bays, sealed concrete floors, quartz countertops and back-painted glass backsplashes in kitchens. Founded in St. Louis, Steelcote pioneered rubber enamel coatings for a variety of products and was once a world leader in the field. It opened the building on Edwin Street in 1922 and finished building out upper levels in 1929. Listed on the National Register of Historic Places and located within St. Louis University’s Midtown Redevelopment Area, the complex has been vacant since 2006. Led by Michael Hamburg, Pier Property Group focuses on the acquisition, renovation and management of historic buildings. It specializes in development opportunities that utilize public/private partnerships and creative financing. Members of its St. Louis-based project team are architect Trivers Associates and the local office of structural engineer KPFF Consulting Engineers. Founded in 1998 in St. Louis by Tom McLaughlin and Nelson Grumney, Jr., Pinnacle Contracting provides general contracting, construction management and design-build services. In its 20th year of business, Pinnacle works in many different markets including historic renovation, office, educational, industrial, healthcare, hospitality, retail and multi-family.